A Road Less Traveled: Lexi Loves School! Lexi is absolutely LOVING school!! We went back and forth forever on where to send her and had decided on the Utah School for the Deaf and Blind. At the last minute, however, we spoke more thoroughly with the vision people in our district, and decided to put her in school right here in Herriman. I am SO happy with our decision. This school is close, and she has the most wonderful people working with her. She has a vision/mobility specialist that is with her all the time. She does a perfect job of helping her without doing too much for her. Her teacher has been fabulous as well, and we are so appreciative of her efforts. Now, every morning, Lexi's first words are, "I want school!" She comes home every day and tries her best to tell me what happened at school. It's amazing how many words she has learned in just three months. This week she was able to tell me such details as how she went to gym, opened and shut her folder, practiced ABC's, learned to spell her name, played on the slide at recess, sang songs with her friends, heard a story about a grandma and grandpa... I mean, isn't that amazing?! We are just so happy for her that she is enjoying it so much and that her language skills are taking off!! Lexi is using a cane now and has progressed so much in the last couple of weeks in how she uses it. I am so excited to see where she is a year or two from now. We are so proud! As a footnote, we now have three kindergartners at three different schools. Yikes! 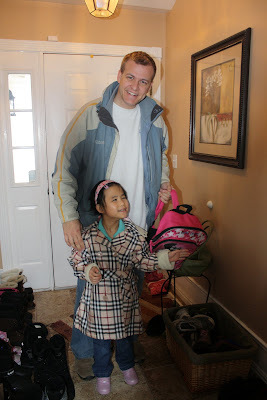 Lexi and Daddy on her first day of school. Yay! What a sweetheart. So glad she's loving school. That's more than half the battle. Sounds like she's having great success! And finally - HOORAH - great news and what a darling child! It is so exciting to hear about her development! And that plaid coat is to die for! Pure joy! What cute pictures! I'm so glad that she's progressing so quickly. What a little ray of sunshine she must be. I cam across your blog through "no hands but ours". I decided to follow you because you have such a wonderful family! We, too, have adopted a child with special needs from China. A boy. And we have a daughter who is vision impaired - losing her eye sight to complete blindness with Lebers Congenital Amaurosis. Since you have two blind daughters, I am anxious to read how school goes for them because our daughter will start Kindergarten in the fall.